The village of Cattistock nestles in the Dorset downs to the north west of the county town of Dorchester. It is known to many as the home of the Cattistock Hunt. It was also home to a returning soldier called Pearce who set up in business as the local carrier a few weeks after the end of the first world war after buying a coal round and carrier service from fellow villager Percy Shorto. Prior to this the business had been with the Shorto family since at least the 1890s. 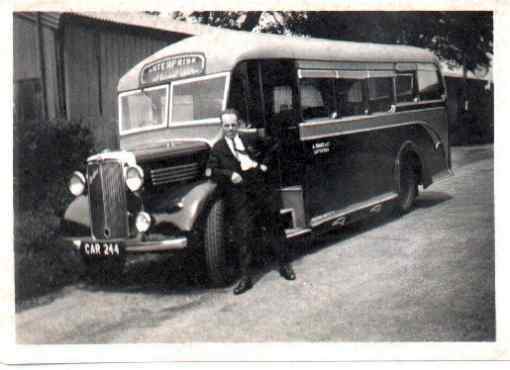 Albert Pearce and his wife Susan, their family and their descendants, were to serve the transport needs of the local area for over seventy years, and their buses and coaches were to become an integral part of day to day life in this quiet corner of the county. At the start in 1919, Albert used horse and cart and mule-drawn van. On Wednesday and Saturday market days he carried passengers into Dorchester whilst on other days he delivered coal in and around the village. Trade was good so extra help was taken on in the form of another ex-soldier George Collins, who was subsequently to marry Pearce's daughter Ethel. Motor vehicles were acquired for the first time, including the purchase new of a 14 seater Ford Model T bus in 1923. The honour of providing the first motor bus through Cattistock fell however to Legg's of Evershot in 1920. 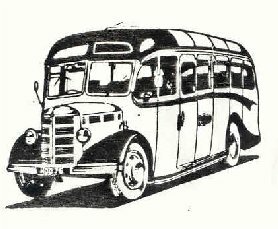 A new service to Yeovil via Evershot was started at this time with the motor bus, running on Fridays and alternate Mondays, but did not last for many years (until reintroduced in 1954). Horse drawn vehicles continued to play a role in the goods side of the business well into the 1930s. School transport was an important part of the business as well, and for some years there was competition for school work - even in the home village of Cattistock - from Mearns of Maiden Newton. The growing business became a partnership between Albert Pearce, his daughter Ethel and son-in-law George in 1925, and traded as A. Pearce & Co.
A modest village, the census of 1931 showed 493 people in Cattistock. It is a pleasing mix of brick and stone cottages and in the centre is a triangle in front of the church where thatch and window mouldings make the older ones stand out from the more recent. There are ancient earthworks on Castle Hill overlooking the village, and King Alfred's grandson Athelstan gave land here to the monks in return for their prayers. Formerly the pride of Cattistock was its renowned carillon of 35 bells cast in Louvain, the first in England. The mellow tones rang out over the village, with a church worthy of a town. Sadly they were destroyed in a fire in the church tower in 1939, but the church remains one of the finest 19th century churches in the county of Dorset. The buses continued running through the second world war but by 1948 there were still only three buses in the fleet. Although Albert reached the retirement age of 65 in 1944 he continued to help run the business (and drove) until he died in May 1956, aged 77. (Susan had already passed on in February 1949, aged 73). George Collins himself died prematurely in 1948 at the age of 48, when Albert's grandson Ivor Collins took over the day to day running of the firm, but still with his mother Ethel's guiding hand. Ethel died in August 1973 at the age of 72. During the 1980s Ivor was succeeded in turn by his son Nigel - the fourth and (last) generation of the family to be involved with the business. Sadly Ivor too passed on prematurely at the age of 58 in 1985. Albert and his family lie together in the peaceful churchyard of St Peter and St Paul in Cattistock. 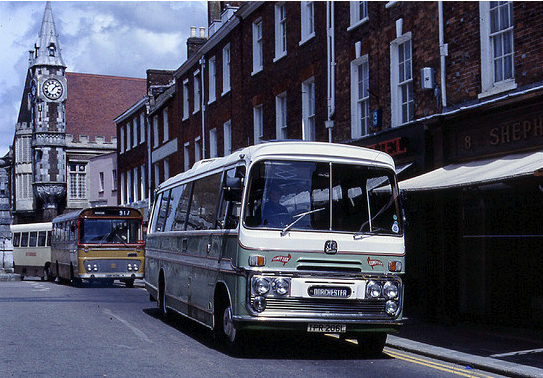 The main bus service was from Cattistock through Maiden Newton, Frampton, Grimstone and Stratton to Dorchester, terminating in the Council Yard off Trinity Street. This was then a wonderful place to be with a rich galaxy of independent operators vehicles gathered together from all the villages around the county town. For many years the Dorchester service was a market days only (Wednesdays and Saturdays) operation. 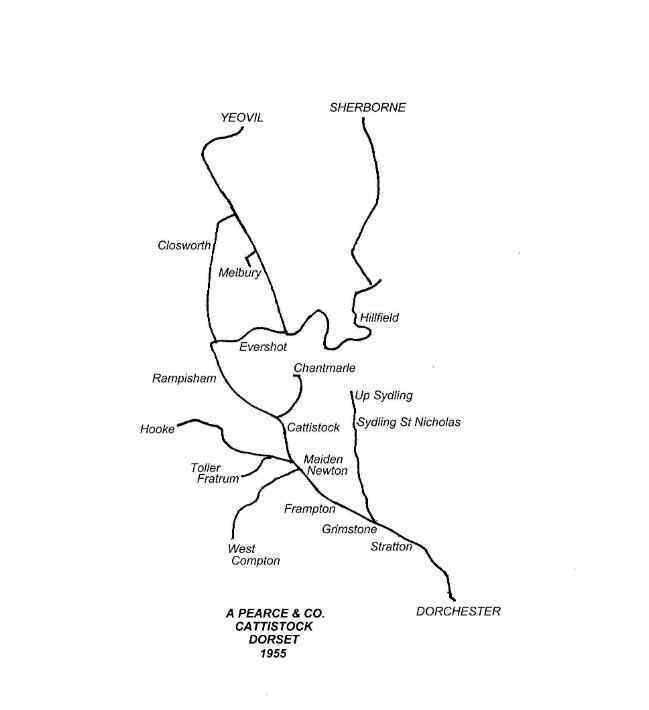 But Pearce's did not have the road to Dorchester entirely to themselves. An Evershot operator called Frank Legg also ran via Rampisham, Cattistock and Maiden Newton on his way to Dorchester - and on the same days as well. Like Pearce, this route had started in the 1920s but in those far-off carless days there was enough trade for all - and of course buses were also very small in seating capacity compared with today. Legg also operated from Evershot to Yeovil three days a week and added a post-war route to Sherborne on Thursdays. Other operators ran locally between Frampton and Dorchester as well - a route that changed hands several times over the years - originally started by Bertie Cox of Stratton in 1925 it passed to Mrs Platt of Frampton for a few months in December 1937 and then to Frank Whitty of Dorchester in February 1938, before passing with the sale of his business to Bere Regis and District in 1942. And lastly there was a horse drawn carrier service provided by Jack Record of Rampisham which survived into the 1940s! The Tompkins family name has many close connections with the Pearce business over the years. Three generations of the family have worked for the firm. Henry "Lew" Tompkins started with Pearce in 1930 at the age of 20 as a coal delivery driver, wages thirty shillings a week. After the war he returned to Pearces, now at a wage of eighty six shillings a week, firstly as a coal driver again, then as a bus and coach driver until his retirement in the 1970s. Lew's son David, who was born in 1931, followed in his father's footsteps and worked for Pearces firstly as driver, then foreman fitter and eventually became a director of the company until the close down of the garage at Cattistock in 1990. Lastly Lew's grandson Paul drove part-time for the company on peak summer Saturdays in the 1970s, usually on the Maiden Newton to Bridport route. In the next valley over to the east from Cattistock lies the village of Sydling St Nicholas, which enjoyed the luxury of two operators (Albert Lovell and Jimmy Crabb in post-war years; Crabb and Frank Terrell pre-war), both providing near identical services into the county town of Dorchester. 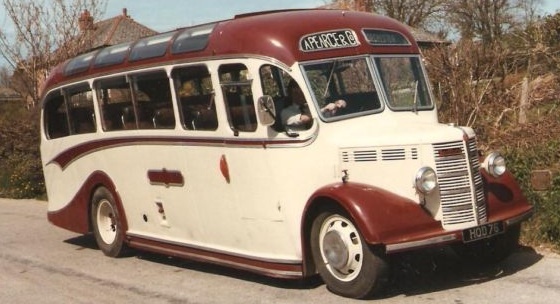 As with Albert Pearce and Frank Legg in Cattistock, both Lovell and Crabb ran only on Wednesdays and Saturdays, and at very similar timings albeit with smallish vehicles. These routes shadowed part of Pearce's route from Grimstone and Stratton into Dorchester. Jimmy Crabb, farmer, carrier and coal merchant of South View Farm, Sydling died in the village in 1950 at the age of 67, followed twelve years later by his wife Nellie also aged 67. After Jimmys death, Pearce acquired both operator's Sydling - Dorchester routes in 1952. Also acquired was Albie Lovell's pre-war Bedford WTB 26-seater JP3302. For a few years the route was extended back to start from the small settlement of Up Sydling, and an additional Friday service introduced. 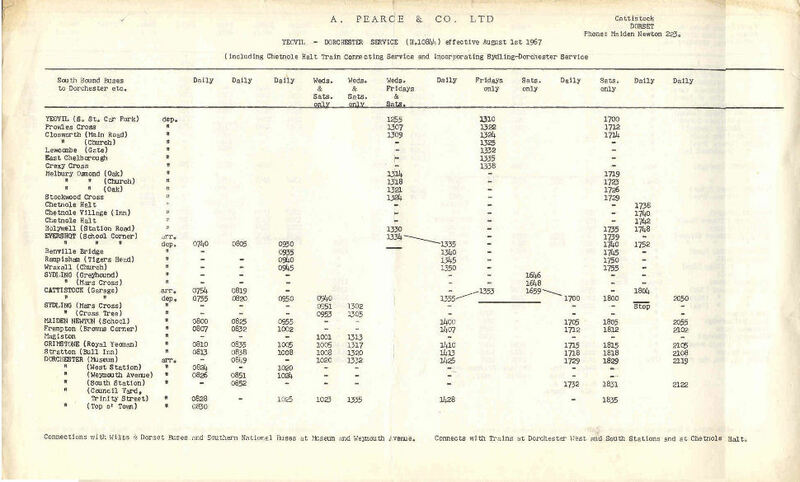 The Pearce fleet had now grown to five vehicles, all Bedfords, with seating capacities ranging between 25 and 33. About this time, in autumn 1951, another new feeder route to the long standing main Cattistock - Maiden Newton - Dorchester service was tried, this was to last for about ten or so years. These connecting services included Chantmarle - Chalmington - Cattistock - Dorchester on Saturday afternoon. This service was primarily for the benefit of staff and trainees at the Police Training Centre at Chantmarle. An express service was also operated, linking Chantmarle to the three railway stations at Yeovil (Pen Mill, Town and Junction), so that trainees could go home for the weekend. It ran northwards to Yeovil at Saturday lunchtime, and returning southwards to Chantmarle on Sunday evening. The settlements lying to the west and south of Maiden Newton also received new bus services at this time. A Wednesday morning market day service was introduced in summer 1949 which started from Hooke, and came by way of Kingcombe and Toller Porcorum to Maiden Newton and Dorchester. A Saturday afternoon service from Hooke was added in 1953. Another Saturday service came from Compton Abbas (also known as West Compton) by way of Wynford Eagle and Toller Fratrum to Maiden Newton and Dorchester. This started in the autumn of 1952, along with a Tuesday evening cinema bus to and from Cattistock. In 1953 the West Compton service was shortened slightly at Shatcombe Farm (not altogether surprising as West Compton parish population in 1951 was but 51 people). The Wednesday service from Hooke was discontinued in 1954 and the Saturday service was diverted to incorporate Toller Fratrum and Wynford Eagle on route to Maiden Newton. In 1955 this was cut short to start from Toller Fratrum. The Tuesday evening cinema bus to Cattistock went in 1957 and in autumn 1961 the remnant of the Saturday operation was altered to fortnightly on the 1st and 3rd Saturday of the month. These wanderings around the lanes had become a much truncated minibus feeder linking just Toller Fratrum and Wynford Eagle to Maiden Newton on alternate Saturdays and this lingered on until 1969. (Doesn't Dorset have some lovely place names)? More expansion of routes was to come. Late in 1954 Legg of Evershot withdrew from the bus business and his four routes were acquired by Pearce on 1st November. Relations between the two operators had always been cordial. This resulted in the introduction of a through Dorchester - Maiden Newton - Cattistock - Evershot -Yeovil route for the first time, based largely around the longstanding days and traditional times of operation of the individual component route sectors, but with some journeys working through from end to end. 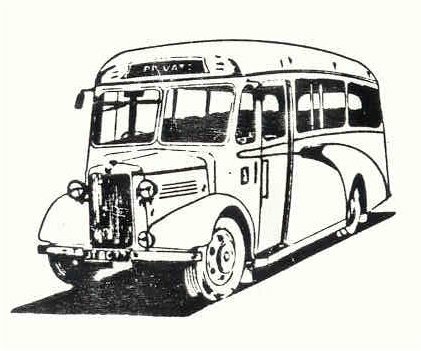 The summer of 1955 saw the introduction for the first time of daily morning and evening workers buses between Cattistock and Dorchester. 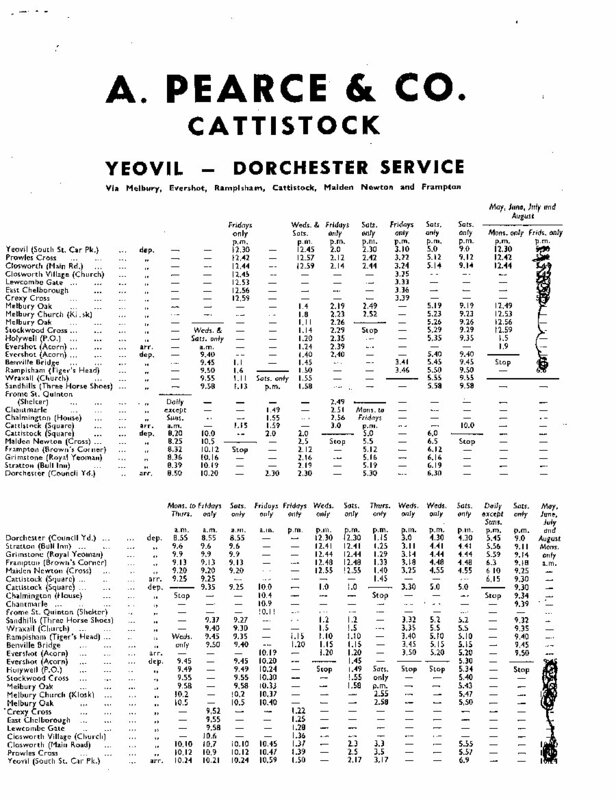 The fare was 1/4d single or 2/- return from Cattistock to Dorchester. 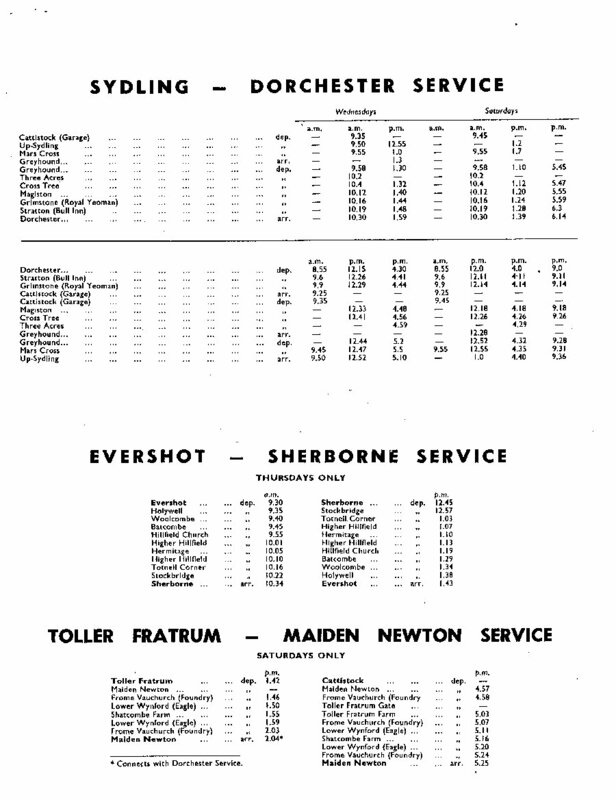 The 1958 timetable is below. 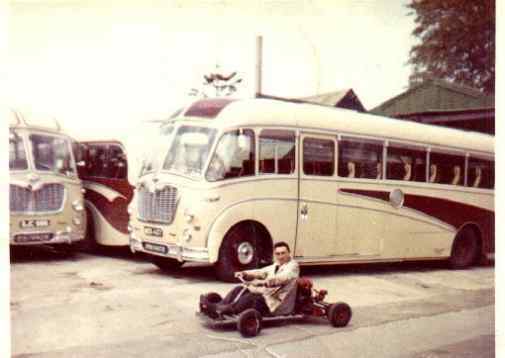 By 1959 the fleet size had reached eight vehicles, and in 1964 the business became a limited company. the 1950s before leaving for Sydling St Nicholas. New in 1951, it was with Pearce from 1953 to 1962. But the major change was to start from 1st August 1967 when the railway stations at Cattistock and Evershot and several other villages locally were closed to passengers. Pearce's main route from Dorchester to Yeovil was enhanced in frequency and there were now several daily journeys between Evershot and Dorchester. 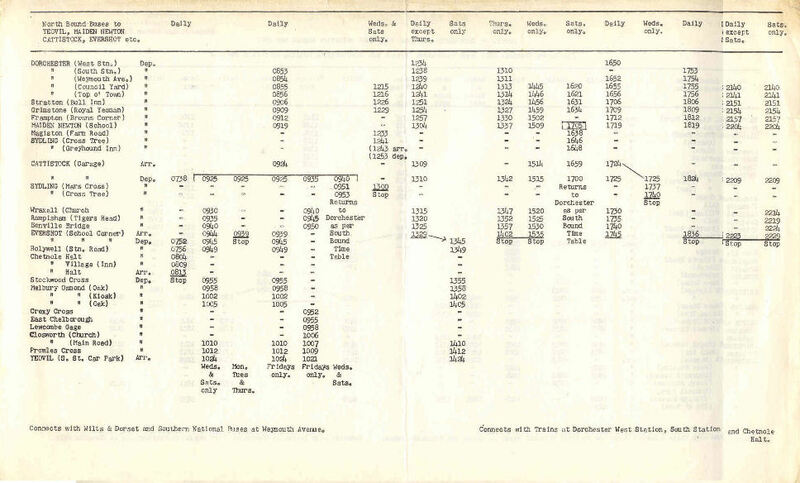 The 1967 timetable is below. A new connecting facility to and from the still open Chetnole Halt was provided morning and evening from Cattistock for several years, to enable passengers to access Yeovil on a daily basis. Like many rail replacement bus services this was to have a comparatively short lifetime and was gone by 1971. A request was made in 1967 to extend the service from Dorchester to Weymouth to avoid the need for passengers to change services. However this was refused by the Traffic Commissioner. By 1972 the fleet size had reached eleven vehicles (including two minibuses), employed on the usual country operator's mix of stage work, school contracts, private hire, excursions and tours. At this time Pearce's entered a long and fruitful period of co-operation with Darch and Willcox, coach operators based at Martock in Somerset, who had advertised their five coach business for sale in 1971. The Collins family thought the time right for expansion and took over the Martock business, with Glen Willcox staying on as adviser. Eventually in 1978 the two companies combined as Pearce, Darch and Willcox Ltd, both using the ComfyLux trading name, but retaining their respective operating bases at Cattistock and Martock. By then there were twenty seven vehicles in the fleet. This is a classic shot of South Street, Dorchester, taken on a market day in 1983. Pearce's Comfy-Lux TPR206L (a Bedford SB5/Plaxton) arrives in town, closely followed by a Bedford YRQ of Bere Regis & District and an Interbus Seddon Pennine on the town service. Happy memories. With thanks to Puckoon for the photograph. In 1975 some journeys on the Dorchester service were diverted at Stratton to double run to serve Bradford Peverell following the withdrawal of the parallel Bere Regis & District service between Dorchester and Frampton. Charminster was also now served for the first time, a populous village near to Dorchester with several housing estates which Pearce's route had had to by-pass previously. Another event in May 1975 was the closure of the Maiden Newton to Bridport rail branch. From May Pearce operated a rail replacement bus service of a basic four return journeys a day plus market day extras. This route was to change hands several times as a consequence of the triennial county council retendering of local bus contracts. 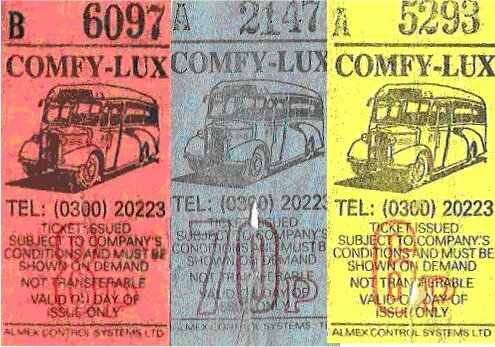 Deregulation of buses in 1986 was to bring further major changes. Like many operators only a few journeys were registered initially to operate commercially, but the firm was successful in winning the county council tender for their main route from Dorchester through Maiden Newton and Cattistock to Yeovil. At this time the tender for the route between Dorchester and Sherborne via Cerne Abbas (operated for many years by Bere Regis & District) passed at deregulation to a very unlikely named bus operator called Air Camelot, based in Wincanton. And yes - they were in the airline business too)! Because of unreliable operation the contract was withdrawn from Air Camelot by the county council and passed for a while to Pearces in 1988, who for the second time were running buses outside of their traditional patch. In November 1989 the Cerne Abbas route passed from Pearce's to Southern National as their route 216. At the same time an even greater calamity befell Pearce's as they also lost the contract for their traditional Cattistock route to Southern National, which became SN route 212. This was a major blow and ultimately led to the close down of the operation at Cattistock, with coach operations now primarily based in Martock. The following year 1990 the firm lost its school contracts after a rebidding exercise which was a significant loss of income. This prompted Nigel Collins to sell Pearce, Darch and Willcox to the Cawlett group, the parent company of Southern National. The contracts for the 212 and 216 were retendered by the Dorset County Council in 1992, and they passed from Southern National to Oakfield Travel. In turn Oakfield lost the contract for these routes because of unreliable operation (it was very difficult to control and supervise buses running 40 miles away from a base in Blandford on the other side of the county), and the routes passed back to Southern National, by then associated with Pearce Darch and Willcox as fellow members of the Cawlett group. The direct connection with the founding family was lost when Nigel Collins (Albert Pearce's great grandson) left the company in September 1994 to pursue other interests, and operations from Cattistock ceased. 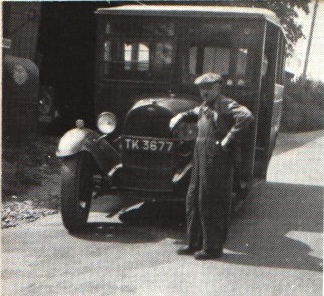 From 1926 onwards, Pearce's operating base had been West End Garage in Cattistock, where Albert had built corrugated iron sheds to house his fleet. Having originally dealt in coal as well, the firm later expanded into motor car repairs and petrol sales. After standing empty for some years in the mid-1990s, the garage disappeared and the site is now a new housing development of six dwellings called Mulberry Orchard. Whilst day to day operations on the ex-Pearce Cattistock 212 route and the ex-Bere Regis Cerne Abbas 216 route were then with Southern National (by now part of the First group), there was still a Wednesday only market bus run by Comfylux (Pearce Darch and Willcox) from Beaminster through Cattistock and Maiden Newton to Dorchester until the summer of 2000. But now the Pearce's name and operation are no longer part of their home village of Cattistock except in memory, although Nigel Collins still lives in the village. For a while a new link between a Dorset operator and a Somerset operator (both of whom used to run into Yeovil so that their buses would meet there) occurred when Nigel became the coaching manager for a while at Wincanton for South West Coaches, the new operators of the ex-Wakes services! 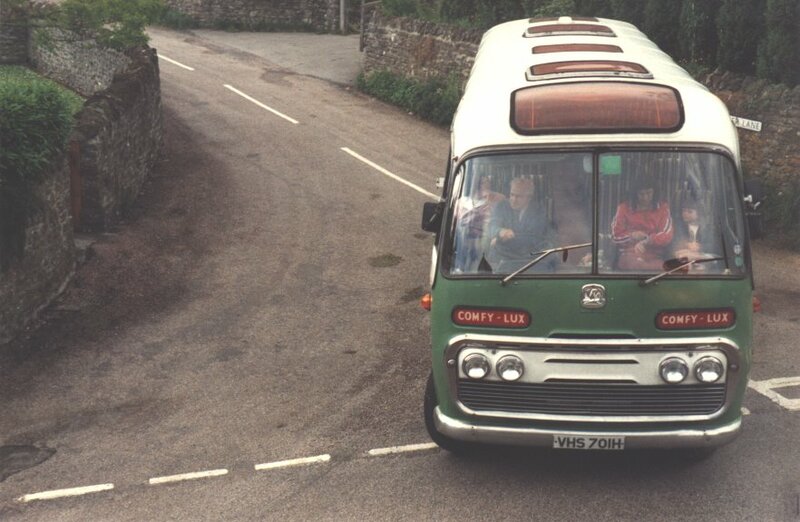 Incidentally, the picture used on the Countrybus index page is Pearce's Bedford WTB JT8077 on a private hire at Milton Abbas in the mid-1980s. For a few years at this time the WTB (once owned by singer Adge Cutler) was used by Pearce on summer routes in the Weymouth area in 1987/88, whilst HOD76 a Bedford OB operated a seven day Vintage Coach Tour to Torquay. The ex-Legg Thursday service to Sherborne which passed to Pearce in 1954 and continued weekly for many years afterwards through a succession of different operators after Pearce themselves had withdrawn from bus operation finally expired on 16th October 2003. For some time there had been only two regular passengers, a lady from Batcombe and a lady from Leigh. Wonder how they will get to the shops now? In 2004 Rampisham lost all its buses and Sydling St Nicholas had only one bus on a Wednesday service to Dorchester and Weymouth that came through from Broadwindsor on First route 213. And further changes came. From Monday 5 September 2005 Sureline of Portland took over the operation of both services 212 Dorchester - Maiden Newton - Cattistock - Yeovil and 216 Dorchester - Cerne Abbas - Sherborne - Yeovil from First. The timetables were put on a basic two hour frequency on each route with the two routes linked operationally at Yeovil to operate as a circular, although that was not advertised. Easter 2007 saw more changes with Sureline still operating commercially on the 212 through Cattistock from Monday to Friday, but Saturday operation of the 212, together with the Cerne Abbas 216 route and the Damory 307 route through the Piddle Valley was largely replaced by Door-to-Dorset flexible demand responsive services, as had already happened on the Maiden Newton - Bridport service (as well as north of Wimborne on the ex-Stanbridge routes, also east of Dorchester on the route to Wool, Bovington and Lulworth). Sureline were taken over by South West Coaches in October 2009. Then yet more change came in April 2011 with the D11 part of the service from Dorchester through Maiden Newton to Yeovil becoming the Damory Coaches 212 (South West Coaches still retaining the bulk of the daily timings). The D12 route from Dorchester through Cerne Abbas and Sherborne to Yeovil became once again the 216 but operated by First Hampshire and Dorset. Similar change in the Piddle Valley with the D13 reverting to Damory Coaches 307. (All these as normal fully timetabled services. These changes came about following the difficulties experienced by previous operator Nordcat. These changes - with similar alterations in the Wimborne, Cranborne, Blandford, Piddle Valley and Bovington areas too - saw the virtual demise of Door to Dorset: farewell to pre-booking - something that will surely not be missed). South West Coaches withdrew from route 212 and despite cut backs in local authority funding the Cattistock route is still run by Damory (autumn 2016) four or five times a day Monday to Friday between Dorchester and Evershot / Holywell with one morning journey continuing to and from Yeovil. Similarly the Cerne Abbas route is continued by Damory as the X11 six times a day Monday to Friday from Dorchester through Cerne and Sherborne to Yeovil, with four journeys on Saturday between Dorchester and Sherborne only. Sad to report but from 24th July 2017 the ex-Pearce route 212 from Dorchester through Cattistock and Maiden Newton was totally withdrawn when county council financial support ceased. There are no longer buses to any of the villages. On the X11 route from Dorchester through Cerne Abbas to Sherborne and Yeovil the operator is now South West Coaches as successor to Damory. A picture from the 1980s showing two vehicles being prepared at Cattistock garage. On the left is UDG924, a Bedford SB / Duple 41-seater, new in 1958, and with Pearce (and Pearce Darch and Willcox) from 1973 to 1987. 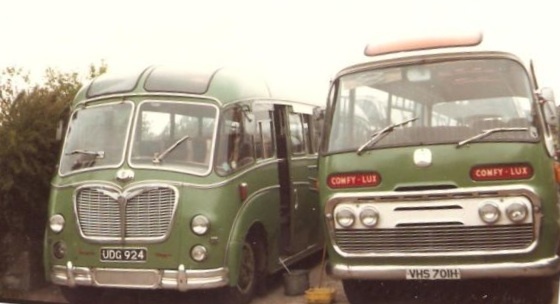 On the right is VHS701H, a 1969 Bedford SB / Plaxton 41-seater, in the fleet from 1980 to 1990. 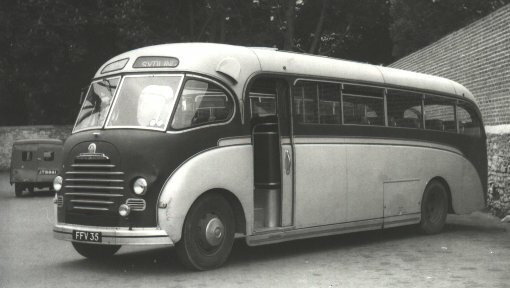 Bedford OB / Duple HOD76 of 1951, a 27 / 29 seater which was used for holiday tours to the West Country, as also was WTB JT8077. The OB was in the fleet for many years from 1962 to 1989. 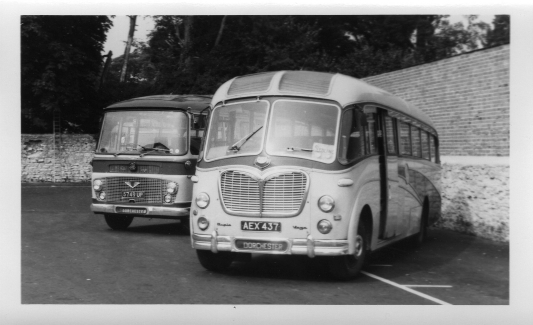 Why not join me on a country bus ride around Dorset over some of Pearce's routes back in 1972?